This Hunter 25 is like new and comes with a Load-Rite tandem-axle trailer. 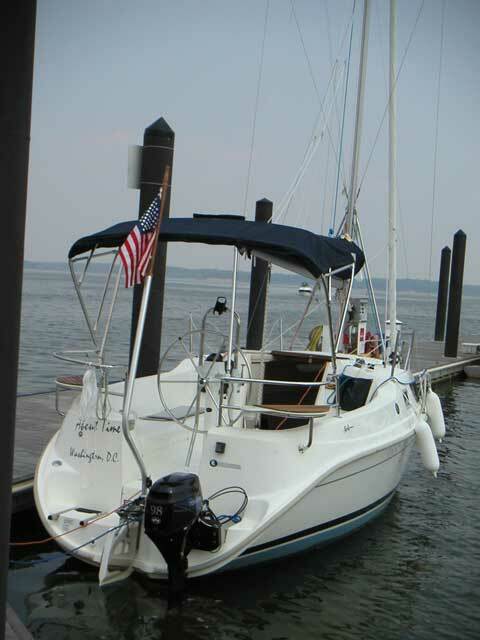 This is a great opportunity to own a beautiful Hunter 25 with all the right equipment. A very roomy boat for a 25-Footer, she is simple to sail and her fixed shoal-draft keel draws only 2 feet, making the Hunter 25 easy to launch. She sleeps 4 adults in her spacious cabin. There is a double berth forward, a double berth aft, folding teak dinette table, large windows & ports for abundant natural light, window shades, 2 opening hatches, 2 opening ports,12v cabin lights and abundant storage. There is also a galley which features a sink with manual water system and a portable ice chest. In addition there is a private head with a marine toilet & holding tank. Outside, her cockpit is spacious and well arranged. There is a folding plexiglass cabin entry hatch which also tilts up for camping, 2 Storage lazerettes, removable helm seat, walk-through transom, stern pulpit with seats, cockpit cushions, fuel tank locker and an integrated fiberglass swim platform with ladder. Her equipment includes: Tohatsu 9.8 hp four-stroke outboard with pedestal mounted controls, Load-Rite tandem-axle trailer with winch & loading Guides, Lewmar pedestal/wheel steering with compass & drink holders, Raymarine Bidata knot/depth sounder, bimini top, roller furling jib, fractional rig with struts, internal halyards led to cockpit, mainsail with storage bag and sail-pac system, mast raising system, mast crutch for trailering, boom vang, cockpit cushions, bow pulpit with stanchions & lifelines, anchor locker, anchor with rode, spare anchor, 12v receptacles, automatic bilge pump, navigation lights, camping top and more. LOA=24'6", beam=8'5", draft=2'0", towing weight=4700#, mast height=31'8". SOLD. I am so pleased with the visibility your website gave me.